For the first installment in Routledge’s “Studies in Music Theory” series, Paolo Susanni and Elliott Antokoletz have contributed a book on analyzing twentieth-century music. As its title suggests, the book adopts a fairly specific framework: it focuses on non-serial, post-tonal music, mainly from the standpoint of scalar collections and interval cycles. The collections include the usual suspects—diatonic, pentatonic, whole-tone, and octatonic—along with some non-diatonic “hybrid” modes, such as Lydian with 7ˆ. The cycles are also the familiar ones: those generated either from moving by a single interval repeatedly or by alternating between two different intervals. Together with these primary topics, the book mixes in a few secondary ones, the chief one being the technique of inversion about an axis. The book is unified by an overarching concern with how these various concepts interact and relate to one another. For a brief sample of its approach, consider the excerpt from Ravel’s Mother Goose Suite quoted in Example 1. (Chapter 6 discusses the opening of the movement up to and including this point [109–11].) The first two measures convey the F major hexachord, i.e., F –G –A –B–C –D , rendered in scalar order. This collection could be understood, at least on an abstract level, as part of a 5- or 7-cycle: B–F –C –G –D –A . Yet this hexachord also comprises portions of both whole-tone collections—F –G –A from WT0 and B–C –D from WT1—in other words, a pair of incomplete 2-cycles. This whole-tone potential is then realized in the next two measures, where the music expresses the WT0 collection, i.e., a complete 2-cycle. The trichord F –G –A , prominent throughout in both hands of the piano part, thus serves as a link from the diatonic (or 5- or 7-cycle-based) first half to the whole-tone (or 2-cycle-based) second half. To its credit, the book features many examples of this sort, drawn from a range of composers spanning from the best known (Debussy, Bartók, Stravinsky) to ones less often discussed (Riegger, Symanowski, Muczynski). Yet a number of problems beset the book. The first concerns its intended purpose: it’s not clear whether this book is meant to be a work of scholarship or a work of pedagogy. Several factors point to the former: the book’s methodological focus; its lack of the usual textbook apparatus (such as exercises, self-tests, and an accompanying anthology); its sheer quantity of detailed analytical discussions, which would make it heavy going for a less experienced student; and of course its inclusion in Routledge’s “Studies in Music Theory,” which is presumably meant for research monographs. Yet the book breaks little ground in the way of original research. Instead, it advocates an analytical approach based primarily on Antokoletz’s prior work. (1) Beyond this, the book exists mostly in a scholarly vacuum. For example, even though the book is centrally concerned with interval cycles, it does not substantively engage with, build upon—or in most cases, even cite—more recent work relating to them. (2) For a more specific but telling example, Chapter 2 shows how to take an augmented triad and move one or two of its pitches by a semitone in order to obtain various major and minor triads. This discussion impinges on fundamental principles of Neo-Riemannian theory, yet the book does not make the connection. Indeed, such is their lack of engagement with contemporary post-tonal music theory that the authors hardly invoke its most basic elements, including not just pitch-class sets and set classes, but even pitch-class numbers. (3) Their stance toward pitch-class set theory emerges most strongly in the Preface, where they dismiss it as a form of “mathematical reductionism” (xiii). In the same paragraph, they concede that pitch-class set analysis “is perhaps applicable to atonal music such as that of Schoenberg,” but then assert that “[t]he complicated numerical formulae that arise from these kinds of analyses are so far removed from any form of simple musical terminology that they tend to further alienate prospective students and teachers.” In lieu of pitch-class sets the authors summon the notion of a “pitch cell,” which they define somewhat vaguely as a “small collection of pitches that are cast according to a specific intervallic structure, or one could say that it is a small collection of fixed pitch classes” (129). Yet these pitch cells are not dealt with systematically, nor is it even clear why a pitch cell must be “small” or what “small” means. As one might expect, avoiding the methodology of pitch-class set theory hinders their study, in terms of both rigor and generality. To take one example, Chapter 3 opens by surveying the combination cycles, including a detailed chart setting forth the complete cycles for all interval pairings (using conventional letter names for pitch classes). A discussion grounded in basic pitch-class set theory would almost certainly clarify that two different combination cycles, if allowed to run to completion, often result in the same collection, and that the combination cycles, taken as a whole, produce a very limited range of collections. (4) Thus, for instance, the 1/7 and 3/5 cycles generate the same collection—the hexatonic (6-20)—yet this is not apparent from the chart or the discussion. For a related example, the final chapter spends several pages on generating “cyclic” tetrachords by “interlocking pairs of equal-interval dyads” (137–43). The discussion amounts to an exercise in the transpositional combination of dyads, yet the authors do not draw upon Cohn’s (1988) work in this area. Were they to do so, their discussion could be more succinct and thorough (though of course doing so would require basic pitch-class set theory). For instance, the authors overlook that if we combine a tritone with itself at the interval of either a whole step or a major third, we get the same tetrachord type. In Cohn’s “x*y” notation (which indicates an interval class “x” dyad transpositionally combined with an interval class “y” dyad), the operations 6*2 and 6*4 both yield 4-24. As a seeming indication of their lack of recognition here, the authors note that in one case the resulting tetrachord is both octatonic and whole-tone, whereas in the other case, they do not identify the resulting set as octatonic. Consistent with its disregard of both recent and mainstream music theory, the book follows its own at times idiosyncratic conventions. For naming the three octatonic collections, rather than adopting the transparent pitch-class notation now in wide use (whereby OCT0,1 = C, D . . . , OCT1,2 = C , D . . . , and OCT2,3 = D, E . . . ),(5) the authors persist with the labels Antokoletz used in his 1984 book on Bartók, according to which Octatonic-0 = C, D . . . , Octatonic-1 = C , D . . . , and Octatonic-2 = D, E . . . (Antokoletz 1984, 76, n. 14). More peculiar, the authors insist that the word “modulation” should only be used when there is an actual change of mode, not merely when there is a change of tonic (3). Thus, according to the book, a move from C major to G major should not be called a modulation, but a change from C major to C minor should be. The authors make some other equally dubious pronouncements. For instance, they contend that when we flatten 2ˆ of Aeolian to make the Phrygian mode, it gives the tonic a “false leading-tone function” that “completely destabilizes the tonal centricity of the scale” (106). But, one might ask, why can’t 2ˆ function as a downwardly directed tendency tone to a more-stable tonic, much like 4ˆ tends toward 3ˆ in major, or 6ˆ toward 5ˆ in minor? In comparing music of the common-practice period to that of the 20th century, they assert “the only latitude left to composers of tonal music is the choice of individual chords they use to fulfill an otherwise predetermined succession” (8). 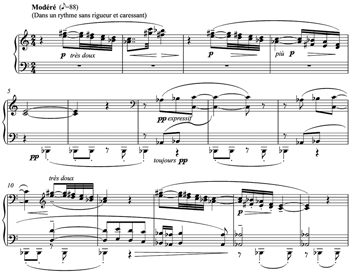 Though this statement might be read as another version of Schenker’s dictum “Semper idem sed non eodem modo” (“Always the same, but not always in the same way”), it nonetheless portrays the act of tonal composition as strangely confining. As one more example, the authors claim that Bartók and Wagner together exemplify “the end of the common practice era” (4). It seems odd both to link these two very different composers, and to claim that Bartók composed at the end of the common-practice era, rather than after it. Returning to the question of the book’s intended purpose, the authors do give some hints that the book is meant to be pedagogical, at least in part. Though they refrain from suggesting a specific classroom use (e.g., advanced undergraduate or beginning graduate), they do say that the book “can be used equally well by both the experienced scholar and inexperienced student” (xv). The pedagogical aspect also emerges in occasional statements that seem directed more toward an “inexperienced student” than to a seasoned scholar. As late as Chapter 3 we are informed that “[i]n much of the music that is representative of the transition between traditional tonality and the new modern musical language, a traditional harmonic analysis breaks down because it cannot account for structures that operate outside its sphere” (51). Yet when judged as a work of pedagogy, the book falls short in some respects. While its comparatively narrow scope is perfectly acceptable for a research monograph, it renders the book too limited for a more general course in post-tonal theory and analysis. This sort of course would benefit from the broader and more balanced approach offered in Straus 2004 or Roig-Francolí 2007. In fact, this narrow focus at times leads to questionable analytical interpretations. Such is the case with some of their examples of axis inversion. To be sure, some of their examples feature clear inversional axes, such as the opening of Bartók’s Bagatelle No. 2 (68), or the opening of his Mikrokosmos 141 (76). But consider the opening of Debussy’s “Voiles” (which the authors discuss on pages 69–70); Example 2 quotes the first fourteen measures. Were one to briefly describe its pitch structure, one might say that the passage operates exclusively within the WT0 collection; more specifically, the bass highlights B as a pedal starting in measure 5, while the other voices emphasize the pitch classes of the augmented triad C–E–G /A , owing to several factors, including duration, metrical position, and placement at high, low, beginning, and ending points of phrases. The authors naturally acknowledge that the passage is whole-tone, but then go on to claim that D functions here as an inversional axis, on the basis that it lies between the G of measure 1 and A of measure 2, and between the C and E of measure 5. Yet the passage as a whole does not strongly assert or revolve around D. Indeed, no axis emerges unequivocally in the passage (although we could make some case for C if we disregarded the pedal B ). The authors’ reading of the passage thus appears to be distorted by an overreliance on one of their main premises. In this case, it seems that a preoccupation with inversional axes causes them to read a dubious D axis into the music. A third issue involves musical examples. Routinely, the authors discuss details of passages without providing adequate score excerpts—perhaps because of a restriction on the part of the publisher. Often the book quotes the first few measures of a piece but then proceeds to examine a good deal more of the music, without giving any more of the score. In many cases, no musical example is given whatsoever, nor even sometimes adequate details regarding the piece under discussion. This is particularly problematic in the case of less well-known pieces. For example, Chapter 2 describes Wallingford Riegger’s “Major Second” in a fair amount of detail (26–27), yet the book gives no musical example nor even says anywhere that this is the second piece of his collection New and Old, Op. 38 (1944). (A more serious inadequate identification of a piece occurs in Chapter 6 where the authors briefly discuss Mozart’s “Piano Sonata in C major,” without specifying which C major sonata by Mozart ). Finally, though occasional proofreading errors are to be expected, the book contains somewhat more than a reader should have to encounter. Most frustrating are several typos in the musical examples, which sometimes involve notes that are vital to grasping the particular musical feature under examination. For example, when the book quotes the opening of Bartók’s Bagatelle No. 2 as an example of inversional symmetry, the crucial first melody note is off by a third, which of course would make it confusing for someone not familiar with the piece to grasp the symmetry here. Despite the foregoing criticisms, I would nonetheless like to conclude on a positive note. Though the book has a number of shortcomings when judged either as an original research contribution or a work of pedagogy, it does incorporate discussions of numerous pieces, including ones by lesser-known composers, as mentioned earlier. As a result—and as was certainly the case for this reviewer—the book may well prompt the reader to delve into a number of pieces and investigate them further, whether for one’s own research or for use in the classroom. Antokoletz, Elliott. 1984. The Music of Béla Bartók: A Study of Tonality and Progression in Twentieth-Century Music. Berkeley: University of California Press. Antokoletz, Elliott. 1986. “Interval Cycles in Stravinsky’s Early Ballets.” Journal of the American Musicological Society, 39, no. 3: 578–614. —————. 1986. “Interval Cycles in Stravinsky’s Early Ballets.” Journal of the American Musicological Society, 39, no. 3: 578–614. Antokoletz, Elliott. 1993. “Transformations of a Special Non-Diatonic Mode in Twentieth-Century Music: Bartók, Stravinsky, Scriabin, and Albrecht.” Music Analysis 12, no. 1: 25–45. —————. 1993. “Transformations of a Special Non-Diatonic Mode in Twentieth-Century Music: Bartók, Stravinsky, Scriabin, and Albrecht.” Music Analysis 12, no. 1: 25–45. Antokoletz, Elliott. 1995. “Organic Development and the Interval Cycles in Bartók’s Three Studies, Op. 18.” Studia Musicologica Academiae Scientiarum Hungaricae 36, nos. 3–4, 249–61. —————. 1995. “Organic Development and the Interval Cycles in Bartók’s Three Studies, Op. 18.” Studia Musicologica Academiae Scientiarum Hungaricae 36, nos. 3–4, 249–61. Buchler, Michael. 2000. “Broken and Unbroken Interval Cycles and Their Use in Determining Pitch-Class Set Resemblance.” Perspectives of New Music 38, no. 2: 52–87. Cohn, Richard. 1988. “Inversional Symmetry and Transpositional Combination in Bartók.” Music Theory Spectrum 10: 19–42. Gollin, Edward. 2007. “Multi-Aggregate Cycles and Multi-Aggregate Serial Techniques in the Music of Béla Bartók.” Music Theory Spectrum 29, no. 2: 143–76. Headlam, Dave. 1996. The Music of Alban Berg. New Haven: Yale University Press. Lambert, J. Philip. 1990. “Interval Cycles as Compositional Resources in the Music of Charles Ives.” Music Theory Spectrum 12, no. 1: 43–82. Roig-Francolí, Miguel A. 2007. Understanding Post-Tonal Music. Boston: McGraw-Hill. Straus, Joseph N. 2004. Introduction to Post-Tonal Theory. 3rd Edition. Upper Saddle River, N.J.: Pearson Prentice Hall. 1. See for example Antokoletz 1984, 1986, 1993, and 1995. Antokoletz’s work, of course, has its own precedents, such as the work of Perle, which the book acknowledges in the Preface (xiv). 2. For example, Lambert 1990, Headlam 1996, Buchler 2000, and Gollin 2007. Lambert 1990 is cited once (Chapter 2, note 24), but only to acknowledge his analysis of Ives’s Psalm XXIV. 3. The authors do resort to pitch-class numbers a few times to specify the transposition levels of the X, Y, and Z cells used in Bartók scholarship. They also rely on the concept of pitch-class numbers to name collections. Otherwise, they do not invoke pitch-class numbers, aside from a cursory explanation in an endnote (Chapter 2, note 7). 4. Barring the trivial case where the two intervals sum to 12 (such as a 3/9 cycle, which would simply produce an  dyad), the resulting pitch-class sets amount to the following: 4-9, 4-25, 4-28, 6-20, 6-35[02468T], 8-28[0134679T], and the aggregate. 5. This notation is used in both Straus 2004 and Roig-Francolí 2007. 6. Two further examples of this problem: Chapter 4 refers to an “X-11 cell,” without explaining that the “11” refers to its transposition level (71); only in an endnote to Chapter 7 is this notation clarified (Chapter 7, note 4, page 152). Chapter 1 refers to “C/C ” and “C/C” axes; we wait until Chapter 4 for an explanation of this notation (without which an inexperienced reader might wonder, why a “C/C” axis instead of just a “C” axis?). See for example Antokoletz 1984, 1986, 1993, and 1995. Antokoletz’s work, of course, has its own precedents, such as the work of Perle, which the book acknowledges in the Preface (xiv). For example, Lambert 1990, Headlam 1996, Buchler 2000, and Gollin 2007. Lambert 1990 is cited once (Chapter 2, note 24), but only to acknowledge his analysis of Ives’s Psalm XXIV. The authors do resort to pitch-class numbers a few times to specify the transposition levels of the X, Y, and Z cells used in Bartók scholarship. They also rely on the concept of pitch-class numbers to name collections. Otherwise, they do not invoke pitch-class numbers, aside from a cursory explanation in an endnote (Chapter 2, note 7). Barring the trivial case where the two intervals sum to 12 (such as a 3/9 cycle, which would simply produce an  dyad), the resulting pitch-class sets amount to the following: 4-9, 4-25, 4-28, 6-20, 6-35[02468T], 8-28[0134679T], and the aggregate. This notation is used in both Straus 2004 and Roig-Francolí 2007. Two further examples of this problem: Chapter 4 refers to an “X-11 cell,” without explaining that the “11” refers to its transposition level (71); only in an endnote to Chapter 7 is this notation clarified (Chapter 7, note 4, page 152). Chapter 1 refers to “C/C ” and “C/C” axes; we wait until Chapter 4 for an explanation of this notation (without which an inexperienced reader might wonder, why a “C/C” axis instead of just a “C” axis? ).